Bill Watterson created one of the most popular, beloved and enduring comic strips of all time – Calvin and Hobbes. It’s ten year run would win the hearts of millions of fans, garner critical acclaim and continue to attract new fans since the strips final panel in 1995. Watterson would become a mysterious figure with an unwavering desire for privacy and his adamant refusal to commercialize his characters in any way. The documentary Dear Mr. Watterson examines the strips impact, it’s legacy and Watterson himself. I was curious about this doc since I am a fan of Calvin and Hobbes. It was one of the strips I used to love to read and since it ended its absence has been one of the reasons why the comics page is something I rarely ever look at anymore. 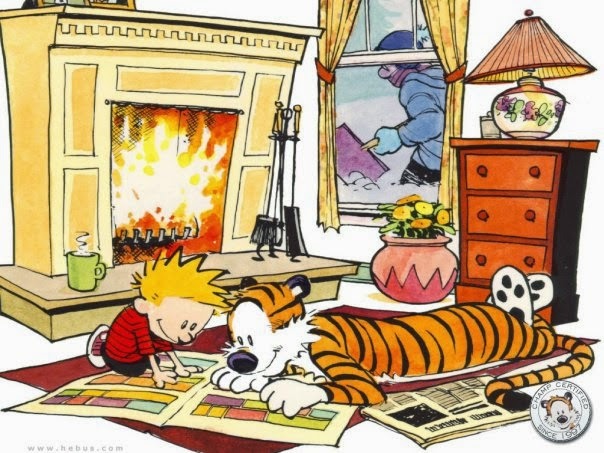 Watterson and Calvin and Hobbes is a great subject and there’s probably a wealth of compelling stories to examine that surround the artist and his creation. Unfortunately, there’s not much to learn from this documentary. Watterson remains an enigma. There’s very little you learn about him. You could attribute that to Watterson himself who has removed himself from the spotlight and clearly wasn’t willing to participate in this film. He’s been described as ‘the J.D. Salinger of comics’. However, I’ve seen docs on Salinger that are much better made and more enlightening on him than this is on Watterson. Basically the movie consists of talking head segments of fans and fellow comic artists who describe their admiration and love for Watterson’s strip. It gets repetitive pretty quickly and the film doesn’t really have anywhere else to go. There’s some segments that seem like they were stops for research purposes in the making of the documentary. The director visits where they house the original Calvin and Hobbes artwork. Yet it’s a weird place to bring cameras since we’re not allowed to see the original artwork for ourselves. I’m guessing there was some kind of policy of not being allowed to photograph it, but if that’s the case then why bother bringing us there for several minutes. Just to watch the directors face as he gets to look at them? A segment on licensing and the commercialization of an artists work is ironically the standout segment. It’s too brief to warrant sitting through the rest of the film though. It’s a disappointing doc. It’s a great subject and it appears the love is there from the filmmaker and everyone that appears on camera, but it’s mostly a tedious slog of repetitive admiration and gushing learning very little about Watterson and his work. I could talk about how I used to cut Calvin and Hobbes strips from the newspaper and tape them to my notebooks, but that’s really not enough content to make a compelling documentary out of. It really is much less a documentary than than it is a gathering of fans into one motion picture, paying respect and fan service to Watterson. I liked it, but I didn't feel like I learned much from it, for sure. In my opinion too, you don't make a document called "Dear Mr. Watterson" unless you've actually gotten a response from said Mr. Watterson. It felt hollow and silly because he was so absent from the documentary.